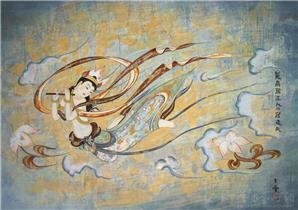 As a famous historical and cultural city of China, Dunhuang used to be an important city along the ancient Silk Road, which directly led to the Western Regions, Central Asia and Europe, and it’s celebrated for its grottoes and frescoes all over the world. Dunhuang is 1,098 kilometers (682 miles) from Lanzhou and 363 kilometers (226 miles) from Jiayuguan, which is convenient for air travel among the three cities. A traditional route of the Silk Road went past Dunhuang from Xi’an, and then led to the Western countries via the current Xinjiang Province. Dunhuang is the westernmost city of the Hexi Corridor,and its long history has accumulated and bred its unique culture, for which it has become a famous city of historic and cultural interests. 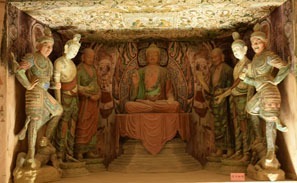 The Dunhuang Mogao Grottoes were listed among the World Heritage Sites by UNESCO in 1987, where over 2,100 colored statues of Buddha of various sizes are retained. The First Spring under Heaven –the Crescent Spring–nestles at the foot of the Mingsha Mountain (Singing Sand Mountain), both of which set each other off in the boundless desert. 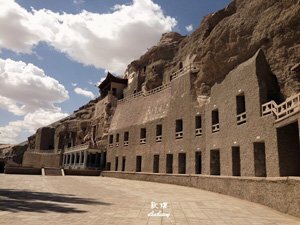 The Jade Gate Pass was an important stronghold along the ancient Silk Road, which protected Dunhuang against invasion from the Western Regions in ancient times. 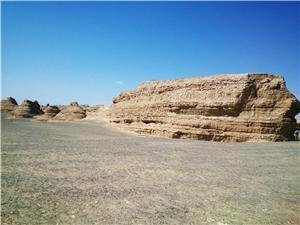 Yadan Landform has been created by the daedal hands of nature, showing the world the mysterious atmosphere of Dunhuang. In addition, Yangguan Pass, Dunhuang Ancient City and the Sanwei Mountains are also wonderful sites for you to explore during your visit to Dunhuang. Dunhuang has an extremely arid continental climate with four distinctive seasons, where the annual average temperature is 9.4°C, with the hottest temperature of 24.7°C in July and the coldest temperature of -9.3°C in January. 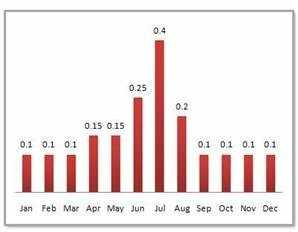 Dunhuang has more than 142 frost-free days each year, where the annual even precipitation is 400 millimeters. The dry and hot wind and sandstorms always take place in Dunhuang in spring each year, so you’re highly advised to avoid them for the sake of your safety. The best times to visit Dunhuang are from May to October, during which you can taste fresh fruits, such as watermelons and grapes. 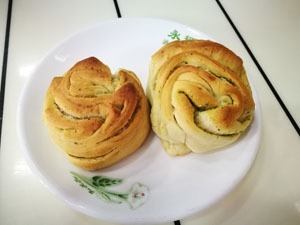 The Dunhuang people prefer eating mutton, chicken and beef, and they are very particular about making wheaten food, including Dunhuang Yellow Noodles, Dunhuang Noodles with Minced Pork and Winter Bamboo Shoots, and Dunhuang Niangpizi. Below are some famous Dunhuang restaurants which the locals highly recommend. 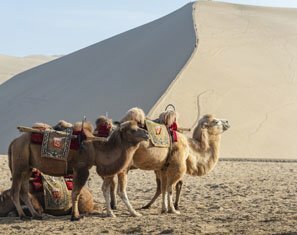 Dunhuang is a full-blown tourist city of China, where most hotels are distributed in the downtown area with the price ranging from 120 RMB to 180 RMB per night, and it’s very convenient to appreciate the folk customs of north-west China at night there. In addition, a number of cheap hostels and youth hostels are scattered near the Singing Sand Mountain Scenic Area, most of which are in the Dunhuang local style, attracting many backpackers each year. Dunhuang has a perfect transportation network of airways and highways, where the inner-city transportation is also convenient, and the most convenient way to visit Dunhuang is by air.The sightseeing trains to Dunhuang are available from Lanzhou, Xi’an and Yinchuan. 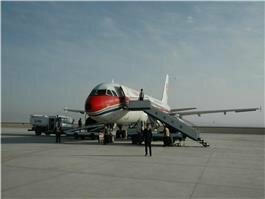 Dunhuang Airport is 13 kilometers (8 miles) east of the Dunhuang city center, where 38 direct flights to and from Lanzhou, Xi’an, Beijing, Jiayuguan and Urumqi are available each week, and it costs about 30 to 40 RMB from the airport to downtown Dunhuang. There are two railway stations in Dunhuang now, Dunhuang Railway Station and Liuyuan Railway Station, both of which have direct trains to Lanzhou departing at dusk and arriving at dawn. Situated 10 kilometers (6 miles) from downtown Dunhuang, Dunhuang Railway Station is accessible by public bus 3 from the downtown area. The K591 train departs from Jiayuguan at 4:56 am and arrives at Dunhuang at 9:30 am each day. The K9667 train departs from Lanzhou at 3:33 am and arrives at Dunhuang at 8:19 am each day. The K591 train departs from Xi’an and arrives at Dunhuang each day. 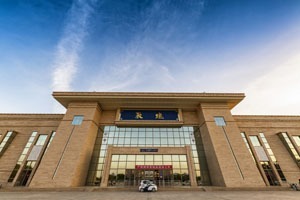 Situated 128 kilometers (80 miles) north-west of Dunhuang city center, Liuyuan Railway Station has trains to Shanghai, Beijing, Xi’an, Chengdu, Lanzhou and Urumqi. The direct buses to Dunhuang city center are also available on the square in front of Liuyuan Railway Station. 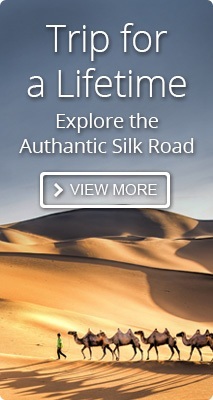 If you are interested in planning a trip to Dunhuang, please see our popular tours below for inspiration. Our tours can be customized — just tell us your interests and requirements, and we will help you tailor-make a tour.